NCERT Solutions for Class 10 Science (Physics, Chemistry, and Biology) have been solved keeping in mind the guidelines issued by the CBSE. This has also been done in accordance with the marking scheme usually followed by the Board. CBSE Class 10 Science (Physics, Chemistry, Biology) All Exercise and Extra Questions with Solutions to help you to revise complete Syllabus and Score More marks. It is an established fact that the impact of NCERT Textbooks on the class room practices is tremendous. Preparation for Board examinations is incomplete without reading these books and doing the exercises given in them. 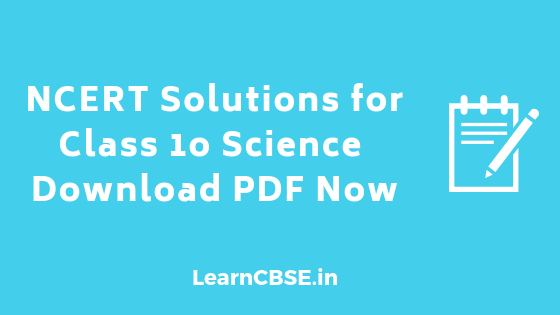 Taking this into consideration, these NCERT solutions for Class 10 Science (https://www.learncbse.in/ncert-solutions-class-10-science/) has been designed to be an indispensable tool for the students. Care has been taken that the answers to the questions are written in a proper form and as per the marking scheme suggested by the CBSE. With the aim of imbibing skills and hard work among the students, the solutions have been designed. It covers the Chapterwise solutions of NCERT Textbook questions and contains Chapterwise solutions of CBSE (CCE) examination questions. Utmost care has been taken to cover all the previous year’s questions. Constructive and thoughtful suggestions for further improvement are welcome.